Simon, Justin, tell us about your hockey curriculum and why, when and where it all started. Simon: Hockey has always been in my family. My father represented Scotland at senior level and my mother played for England at mixed hockey level. I took a different route however, as I was more interested in soccer, cricket and rugby when growing up. It wasn’t until I was 18/19 when I started playing properly for my home club in Manchester, Bowdon. I was accelerated quite quickly into representative hockey and then fortunate enough to be selected for England but also to see a lot of the world through club hockey which I have played in Australia, New Zealand, Germany, Holland. Justin: I come from a hockey family, my dad and uncle both played for South Africa for many years. Initially however, I preferred rugby and didn’t really want to play hockey. We moved to a different city when I was about 10 and I played rugby there for a while, but eventually tried hockey as well. I started enjoying it and developing a bit under the guidance of my father. When I was about 16 I decided that I wanted to make a go at playing international hockey and to try and get to the Olympics one day. In 2008 I got the opportunity to play in Belgium and after 2 seasons there, I went to Australia for a season, before getting the chance to play in the Hoofdklasse at Pinoké in 2010. I’ve been fortunate enough to play 3 World Cups, 2 Commonwealth Games and the London Olympics in 2012. Justin, you started at AH&BC in 2012 and are still there, what was the biggest difference between Dutch & the South African hockey? I moved to AH&BC in 2014, after being at Pinoké for four seasons. The biggest difference, is that while the Netherlands has a national competition, South Africa plays its hockey in provincial competitions, only hosting one national competition per year for one week. That is slowly starting to change, with another national competition being introduced last year. The level of hockey and training available is much higher in the Netherlands and if you really want to, you can make a living as a hockey player here. That is impossible in SA. In the youth, most sports are played at school in SA which is obviously different to the Dutch club system. I like that the sport is played at clubs here in the Netherlands, as kids are exposed to new people and coaches/trainers outside of their school environment. Simon, you’ve played for HGC and now HC Rotterdam, and apart from having played in England, you have also played for New Zealand, Australia and German teams. What are the biggest differences between those countries and Dutch Hockey? Hockey has such a huge audience in The Netherlands, that brings with it sponsorship and money to the game. This creates more of a professional sport which really can’t be compared to the other leagues. I think any player who plays hockey always has ambitions to play in the Dutch league as they know it’s the best in terms of the standard of trainings / games, and also spectator levels. Dutch hockey has great attacking flair and you see that most games in the Hoofdklasse. That’s what separates the Dutch league most from other leagues. Each of the other leagues I have played in were different, for example, the German league is based around (not surprisingly) ‘defence first’, Australian hockey is very aggressive and attacking. The English and New Zealand leagues are more around tactical play but probably don’t have the playing standard of perhaps the Dutch and German leagues. Justin, you play for 020 and Simon, you play for 010. Amsterdam vs. Rotterdam are the typical Ajax-Feijenoord opponents in hockey, but you’re also colleagues in drag flicking. What is it you love about that specialty and when did you find out that it was your thing? Justin Reid-Ross. Foto : Ben HaeckWhat I love most about drag flicking is that it is a skill that is entirely unique within the game. Lots of people can do it, but to excel at it you have to have a combination of technique, power and mental strength. It is a constant battle against not only the keeper and the PC defence, but also against yourself. I started flicking a bit when I was about 17, because I realised at that stage that if I was playing in midfield or at the back, I wasn’t going to score many goals. I’ve always loved scoring and when I saw the drag flick for the first time, I decided to teach myself how to do it. Simon: If I’m honest, I just love scoring goals! I have been flicking corners for about 7 years and I enjoy the technical aspect of constantly trying to improve your technique to make your drag flick quicker, or even put more disguise on it. I’ve never really been taught by anyone, I once had a session with Bram Lomans at HGC. So most of my technique has come through trial and error. I’m not blessed with height, which I believe helps, so I have to look to other ways of generating extra power. Some of that work is done in the gym away from the hockey pitch. A few weeks ago I spoke to Bram Lomans, who as you both know was the Dutch National drag flicker before Mink van der Weerden, and he told us that you can be a great drag flicker, but it also depends on the how you work with the injector and the stopper (first castle). Do you have a favourite combination in your team and how do you (if you do) train together? Simon: This to me is very important. As a lot of drag flick training is done on your own, practice takes place with a stationary ball. So having a stopper who can stop the ball dead is extremely beneficial. The injector also plays a part in this, if the ball is not pushed out straight, that can move the stopper. Also the speed they generate when injecting the ball can give you a little extra time to get your drag flick away. At Rotterdam Hidde Turkstra is quick at injecting and we have quite a few people who can stop the ball well. Justin: That is very true, and 90% of the result of the corner comes down to the quality of the push out and the stop. I’m very fortunate that at Amsterdam we have world class players pushing out (Jan-Willem Buissant & Mirco Pruyser) and stopping (Fergus Kavanagh & Billy Bakker). We tend to train most of the time with the entire PC team and mix and match the combinations of pusher and stopper, so that everyone knows how everyone else executes their skill. What I think a lot of young players forget is that pushing out and stopping PCs are also specialist skills that could make the difference in being selected in a team or not one day. Justin, the last time you played for SA was in the World Cup 2014. 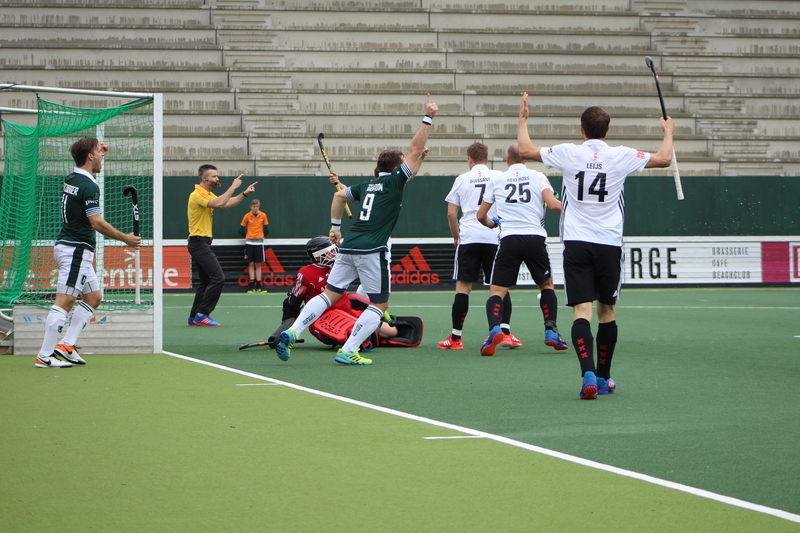 One of your teammates on the SA national team was Austin Smith, who you compete against as he is the Den Bosch H1 player and captain. Do you feel you could train enough together as a team? Austin and I are great friends and have played together for SA for a number of years. I think that we both feel that the SA team could compete at a much higher level if we trained together more often, but also if more players were encouraged and allowed to go overseas and hone their skills. At the moment however, it is almost impossible to combine playing club hockey in Europe and a career in the national team, as player’s have to pay their own way for many tournaments and selection camps and if players are based in Europe, it become very expensive, very quickly. Simon, you do not play for your national team anymore, but how do you look back on your England hockey years? I loved playing for my country, I’m hugely patriotic. Going to tournaments and also the friendships you make are a highlight. I did find it draining mentally and financially at the time. As I was never on any funding I had to travel from Manchester to London (320kms) for day trainings whilst trying to hold down a full time teaching job. This was ultimately too much and I grew frustrated with the system. I made the choice to go to HGC and thus was no longer considered for selection, a decision which I really wish I would have made earlier. What do feel about the new Pro Hockey League towards the HWL and Champions Trophy, will it put more pressure on the Hoofdklasse hockey season? I think only time will tell. It’s hard to see what the effect will be until these tournaments come along. The Hoofdklasse season this year is already quite busy, with a few double-header weekends, so it will be interesting to see how these tournaments affect it. Sometimes I can’t keep up to date with the amount of changes and tournaments in the international fixture list! It seems a lot more international hockey will be played, which we all hope raises the profile of the sport. I think the pressure will be on the individual player rather than the teams in the Hoofdklasse. More games will bring tired bodies, but maybe more importantly it won’t give these internationals much time for anything else in their lives! Hockey unfortunately isn’t a sport where large sums of money are made, and I feel this idea may shorten the careers of players either through ‘burn out’ or because they will have to make time to study or gain employment. How about the new Promotieklasse in between the Hoofdklasse and Overgangsklasse? Do you consider this a smart idea for clubs like i.e. Almere Heren who just made it to the Hoofdklasse? I think it’s a good idea and hopefully reduces the gap of newly promoted teams to the big teams. Many teams are relegated the year after they join the Hoofdklasse. This should in the long term bridge this gap and also possibly encourage younger players from these teams to not move away. Yes, I think that the Promotieklasse is a good initiative from the KNHB to bridge the gap between Hoofdklasse and Overgangsklasse. It is always difficult to survive promotion, and I think the difference in level at the moment is too big. I think that the Promotieklasse will help teams to perform and compete in the Hoofdklasse if they gain promotion. You both have famous Instagram dogs (Justin’s dog Harvey & Simons dogs Winston and Hugo). How are they and how did this happen? Justin: Haha! Harvey is good, living a typical dog’s life of eat, play, sleep, repeat. I wouldn’t say Harvey is Instagram famous as he doesn’t have his own Instagram account or anything. He just pops up regularly on my or my wife’s pages. He’s a pretty funny looking guy so we like sharing his adventures with our friends and family back home. Simon: The dogs are great. This was mainly down to my fiancé. She posted pictures of the dogs on her Instagram and found this attracted a lot of attention. It kind of spiralled from then on, Now they have 37k followers and have more sponsorships than I do! It’s all just good fun! Last but not least: Do you have some advice for your young Dutch hockey fans who want to become a drag flick pro too? Do’s and Don’t’s? What to look for in a stick and how to get there? Simon: Drag flicking takes a lot of practice and extra hours of training, don’t be worried if you struggle at the start, becoming good at a skill doesn’t happen over night! I have always watched videos of the best corner men in the world and tried to take away one idea from them, everyone’s technique is unique to themselves. The right stick can help, a lot of corner men prefer to use a lighter stick with a low bow, this is something I do. I think the most important thing is to enjoy doing the skill but also concentrate on your all round game… a lot of goals are scored not from corners also! Justin: I agree: there is one simple trick to becoming a good drag flicker and that is training. It’s a skill that requires hours of practice, improvement and working through issues. I love watching videos of other great drag flickers and trying to take elements of their techniques and see if they can improve mine. In terms of sticks, you can learn to drag flick with any stick. Use what you have and don’t necessarily go out and buy a stick because it is a “drag-flick stick”. Most of all, enjoy the process of getting better. It takes time, but the reward it worth it. Next PostVan strafcorner specialist naar gespecialiseerde coach. De 5 voor Bram Lomans.